A helper class to denote that an op does not have a default engine. 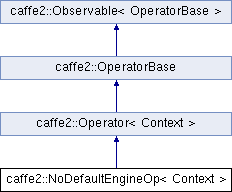 NoDefaultEngineOp is a helper class that one can use to denote that a specific operator is not intended to be called without an explicit engine given. This is the case for e.g. the communication operators where one has to specify a backend (like MPI or ZEROMQ). Definition at line 19 of file no_default_engine_op.h.